The battle over Judge Brett Kavanaugh’s nomination has pushed to the fore the question of sexual abuse survivors’ credibility. For Kavanaugh’s defenders, the judge’s impeccable credentials speak to his integrity — while Christine Blasey Ford’s inability to recall every detail from the day of her assault means she must be lying, or at least confused. The responses to the Kavanaugh-Ford hearing are a reminder that, for many, the credibility of a person hinges on whether they have power. The greater your status, the more likely you are to be believed. And in our culture, no one has less power than prisoners. When Jan Lastocy was in prison, she was reminded again and again that her word meant nothing. The warden told all new prisoners that they shouldn’t even consider reporting sexual assault, because she would always believe her staff over an inmate. 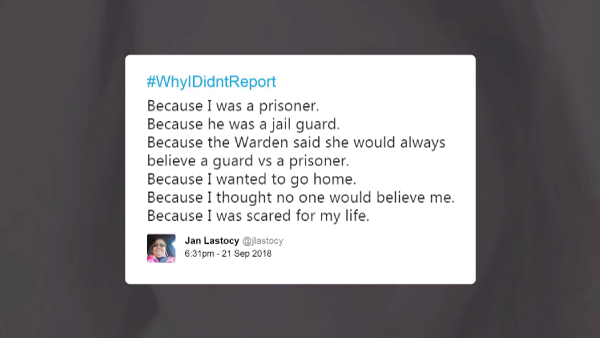 When she was raped a few weeks later by an officer, Jan knew she wouldn’t be believed. So she stayed quiet — and the assaults continued. Every year, JDI receives thousands of letters from incarcerated survivors. When a survivor reaches out, we always respond the same way: we believe you. It is well within our grasp to create safe spaces for people to report abuse — in prisons and jails and in the community. But unless we stop placing greater value on some lives than others, stop believing the powerful over the powerless, survivors will remain silenced. People can have credibility even if they once committed a crime — and they can lack it entirely even if they wear a uniform, or a robe.